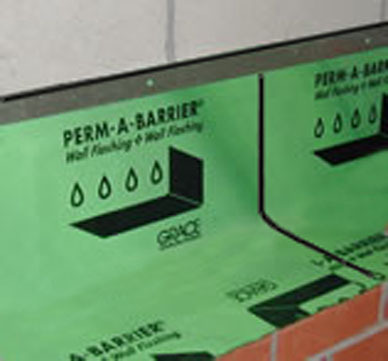 With an extra thick HDPE layer than most other GCP flashings for protection of the waterproof membrane, Perm-A-Barrier® Wall Flashing is the ideal Wall Flashing for heavy-duty masonry applications. 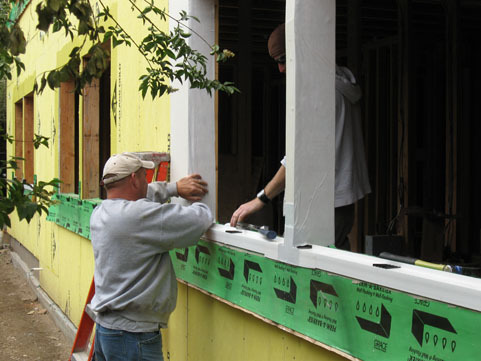 Ideal for both new and retrofit applications, Perm-A-Barrier® Wall Flashing is a 40-mil through wall membrane designed to collect water entering wall cavities and direct it to the exterior through the wall's weep system. Its unique green color and repeated imprinted logo quickly differentiate it on the jobsite from other flashing types. Easy to install, Perm-A-Barrier® can be applied to concrete, masonry, block, steel, gypsum and wood and is highly effective even on vertical surfaces and around details. Available in 83.3' rolls in widths of 12", 18", 24" and 36".